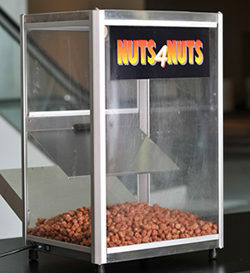 Nuts4Nuts is currently seeking motivated self-starters to bring Nuts4Nuts to other parts of the country and world. 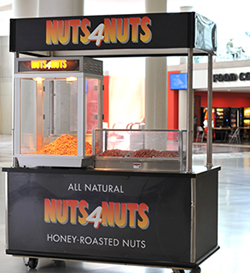 Concessionaires have started operations large and small from locations as close as the Jacob K. Javits Convention Center in Manhattan, Washington D.C., and Miami, and as faraway as Chile, Spain and Turkey. With as little as $10,000, you can open a single cart operation anywhere in the world. 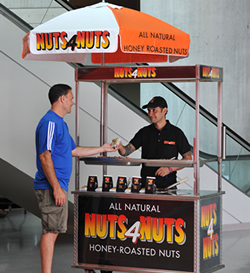 Nuts4Nuts will teach you the cooking process, provide sales materials, assist you with venue acquisition and secure an approved supply source. There is no expensive mix to purchase from us. Once you are in business, you will be your own boss earning fantastic margins with a product with a proven track record. The profits you earn will be as sweet as the product you are selling!